Be the first to share your favorite memory, photo or story of Marty. This memorial page is dedicated for family, friends and future generations to celebrate the life of their loved one. 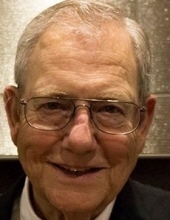 Marty Eugene Sixt, 84, of North Liberty, Iowa, died on Saturday, December 8, 2018, in Coralville, IA of complications of heart disease. Marty was born December 17, 1933, in Winner, SD, to Martin Sixt and Verna (Vonne) Reagan Sixt. His sister, Barbara Sixt Warnock Justice, was born in 1937. The family moved to Sibley, IA, in 1939, where they farmed for many decades. Marty was a standout athlete at Sibley High School and was a member of Future Farmers of America. He graduated in 1952. Marty first attended Iowa State University, and then took time off to earn money by welding and other jobs in Alaska. His stories from that period have entertained many generations of family and friends, and on more than one occasion prompted parents to send their children to bed early. Marty then enrolled at the University of Iowa to study mechanical engineering. In 1956 Marty married his hometown sweetheart, Shirley Smith, of Sibley, IA, and together they had 6 children: Jerry, Mary Beth, Karen, Tom, Rosemary, and Martha. Three of these children were born before Marty graduated from the U of I. After earning his engineering degree, Marty took a job with Plax in New Jersey. He moved the family east, and for the next few years grew his family and his career, with stints at Celanese and American Can. He was at the forefront of the nascent plastics industry, and designed production machinery for plastics manufacturing. In 1966 he and a few associates founded Advanced Drainage Systems (ADS). Marty designed the process to manufacture plastic corrugated drainage tubing. By 1967 the tubing was rolling off the line. Marty hit the road promoting the product, doing demonstrations, or driving until he saw a golf course or a construction site that needed drainage. He then convinced the contractors to buy his tubing. On his way home, he would buy gallons of freshly shucked oysters from the oystermen in the bay, and bring them home for supper. That year he spent exactly 2 nights at home—Thanksgiving and Christmas—and those he spent in his favorite chair. Marty held several patents, and helped develop the market to the point that ADS tubing largely replaced clay tile as the method to drain fields for agriculture and development in much of the world. Marty has continued his association with ADS, and recently wrote a history of the firm and was honored at Ring Club events by the firm. Marty moved his family back to Iowa City in 1969. In 1972 they relocated to a farm north of town on Rapid Creek Road, where his children could roam freely. The farm was the social hub for many of his friends. Sunday night barbeques and New Year’s Day “Morning After” parties stand out as indelible memories. Marty was also a late model stock car enthusiast, and built a shop on the property to build and maintain the cars. As children, we learned much of our colorful language in the company of the pit crew and drivers as we loitered underfoot at the shop. The smell of racing fuel and grease mixed with paint is still a sweet one! Above all, Marty was kind, a good and colorful friend to everyone he met, and an encouraging and adventuresome father. His long letters at birthdays, upon the birth of a child, or the death of a friend or family member were full of love and deep feeling. He never ran out of stories, and his memory was legendary. He could tell you the exact date, day of the week, time of day, type of weather, and every person involved in any event. He knew the names and histories of each of his friends’ children, their children, what they did for a living, who their friends were, and on and on. His interest in others was inexhaustible. When he began a story, it was best just to put on the coffee and settle in. Marty is survived by his wife, Cindy Harrington; five of his six children, Jerry Nepon-Sixt (Janice), Mary Beth Sixt-Jackson, Karen Guth (Joseph), Rosemary Roelf (Michael), and Martha Kirby (Bob); grandchildren, Cortney Haliburton, Brook Nepon-Sixt, Maxine Jackson, Denver Jackson, Celia Jackson, Jacob Guth, Rose Guth, Allison Slager, Kelly Roelf, Mason Greer, and Alexis Kirby; great-grandchildren, Carter, Weston, and Levi Slager, Kellan Halliburton, and Sophia Mank; his sister, Barbara Justice; nephews, Tim Warnock (Debbie), Wyatt Smith, and Steve Munz (Amy); nieces, Denise Starner and Allison Rogers; Cindy’s children, Kris Scheibe, Paris, Toni, and Shapri Martins; and the many, many friends who he considered family. He is preceded in death by his parents, and by his son, Thomas Carlton Sixt (1963-1998). A service will be held in Marty’s memory at New Song Church, 912 20th Avenue in Coralville, at 4 pm, Saturday, December 15th. A reception will follow in the social hall. In lieu of flowers, remembrances may be made to The Parkinson’s Foundation ( https://www.parkinson.org/) or the Epilepsy Foundation (https://www.epilepsy.com ). To send flowers or a remembrance gift to the family of Marty Eugene Sixt, please visit our Tribute Store. "Email Address" would like to share the life celebration of Marty Eugene Sixt. Click on the "link" to go to share a favorite memory or leave a condolence message for the family.